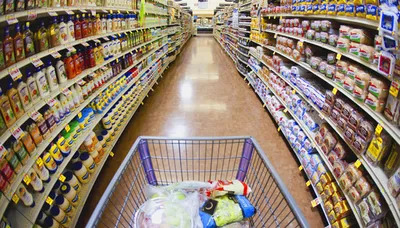 Are You Food Shopping Under the Influence? Every time you walk into a food store, you're toting emotional baggage with you. Add to that the sights and smells of tempting foods and calculated displays, and you're SUI: shopping under the influence. Here's what to do the next time you're behind the wheels of a grocery cart. "I sat in the parking lot, ripped open the bag of M&M's and gobbled them as fast as I could," one of my clients recently told me. She had gone to the supermarket right after she left work, upset about an e-mail a colleague had sent, and drowned her despair in candy. No matter what kind of day you're having, though, the truth is that every time you walk into a food store, you're toting emotional baggage with you. Add to that the sights and smells of tempting foods and the allure of free samples and calculated displays, and you're SUI: shopping under the influence. But there are proven ways to prevent stress, anxiety and fatigue from taking over. This is what to do the next time you're behind the wheels of a grocery cart. You saw an unflattering picture of yourself on Facebook (thank you, "friend," for tagging me in that puffy-coat photo). And now, even if you haven't gained an ounce, you're feeling down about your body. That can kill your motivation to avoid fattening foods, because you figure you might as well eat whatever you want. One of my favorite snap-out-of-it tactics is to give your healthy body props. That may sound dippy, but it forces you to take stock of all the great things it lets you doâdance, push through a workout, hug the people you love. Focusing on positive, active stuff reminds you why you want to eat right in the first place. Distraction can also do the trick. Some clients pop in earbuds and listen to a feel-good song when the fat talk starts. You walk past the sweets section and see a frosted brownie with your name written all over it. You think, I worked out three times this weekâI deserve it! When you're about to claim your reward at the bakery counter, stop in your tracks and visualize all that energy and sweat you put into spin class. Tell yourself, I just worked off hundreds of caloriesâdo I want to blow it all on a brownie? It's good to have a tool like the MyFitnessPal app, where you can track the number of calories you burn daily. Stick with my 50 percent rule: Allow yourself up to half the number of calories you burned as a treat, and only on the days you've worked out. So if the treadmill shows you burned 350 calories, go for a goodie that's no more than 175 calories, like three individually wrapped squares of dark chocolate. You've been putting in late nights for work or side projects. As you whiz through the supermarket aisles, you spy your kids' all-time favorite sandwich cookies. It will make them so happy if you surprise them, so you grab a package. Then you toss in the sugary cereal. And the potato chips. Later in the week, you're digging into the bags yourself. It's impossible to rule out food as a token of affectionâthere's a reason boxed chocolates were invented. So show your family (and your waistline) the love with just one favorite nosh. Maybe this week it's the sugary cereal and next week it's all about the cheese puffs. Just be sure to balance it out by picking up healthier favorites, like grapes or pre-portioned hummus packs. Whatever happenedâyour car broke down, you found out your house needs a new roofâyou're frazzled. You fill your cart with ingredients for some comforting standby, like your mom's mac and cheese, cheese, cheese. Promise yourself a chill-out treat for when you get home, like a new book for your Kindle or a DIY facial. You want to soothe yourself without resorting to caloric comfort (an excellent food strategy in general). Having something to look forward to can propel you past temptation. If you're really on the verge, head to the prepared-food section, where you'll find healthy choices such as precooked salmon or kale salad. You can always grab what you need for that night and do a bigger shopping trip later, when your willpower is stronger. Let's face it: Sometimes life feels boring and your only chance to get your thrills is your weekly trip to the grocery store (Italian deli meat! Imported beer! Macaroons!). While trying different foods is a great way to spice things up, it may not do your diet any favors. Have fun with healthier exotic fare. You've probably walked by rambutan (a spiny Malaysian fruit with a sweet, tangy inside) and sumac (a fragrant Middle Eastern spice) dozens of times without noticing them. Also look for cashew butter to spread on dates or dried figs, or interesting grains like red quinoa. They'll add flavor to your lifeâthe kind that won't pack on pounds. Cynthia Sass is a nutritionist and registered dietitian with masterâs degrees in both nutrition science and public health. Frequently seen on national TV, sheâs Healthâs contributing nutrition editor, and privately counsels clients in New York, Los Angeles, and long distance. Cynthia is currently the sports nutrition consultant to the New York Rangers NHL team and the Tampa Bay Rays MLB team, and is board certified as a specialist in sports dietetics. Her latest New York Times best seller is S.A.S.S! Yourself Slim: Conquer Cravings, Drop Pounds and Lose Inches. Connect with Cynthia on Facebook, Twitter and Pinterest.